Unknown - Can you help Identify? Can anyone help me identify this tool? 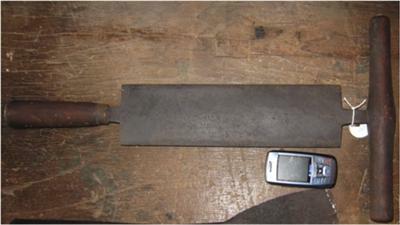 Blade is about 11.5 inches long. Both edges appear to be cutting edges, and, as you can see, it has two handles one in line and one perpendicular to the cutting edges. Makers mark appears to be "W. Cox," but I could be wrong about that. Saw it on Long Island, New York. Comments for Unknown - Can you help Identify? I'm guessing that it may be a hide scraper, for cleaning hides before tanning.